Dozens of residents of this village in rural northwestern India assembled on the floor of their one-room schoolhouse on a damp morning this summer. The women wore vibrantly colored scarves and the men collared shirts. Children outside leaned on the barred windows to listen in. At the front of the room, four visitors sat in chairs and began going through a list of prepared questions. In an exchange translated by a village elder from their native Gujurati to English, a picture of daily life emerged: Many of those gathered make as little as 10,000 Indian rupees, or $150 a year, working on small plots of anemic farmland. They have no access to running water; residents have to climb up and down a small hill to draw water from one hand pump. Many of the residents — and most of the women — have never been outside the village boundary, let alone to a hospital. Every day, the village's mud-and-stone huts are cloaked in darkness, even in the noontime daylight. In one home visited later by the team of visitors, kerosene fumes hung thickly in the air and a stash of firewood was piled within reach for cooking. Just weeks before, a venomous snake had sprung from a dark corner — where it was hidden in the shadows left by the kerosene lamp — and killed a 9-year-old boy named Shravankumar. Compiling the grim data, an already uncomfortable John Camillus grew visibly shaken. The 71-year-old University of Pittsburgh business professor wasn't fully prepared for the stark poverty, the inequality seen in many low caste communities that — he had admitted somewhat sheepishly on the car ride to the village — he generally avoided during frequent trips back to his native country. Yet here he was, sitting above dozens of people who greeted him with a bundle of flowers and who pressed a ceremonial red mark of a bindi between his eyes. He was here to offer a plan to help improve living conditions: a solar power installation that should bring clean, reliable and affordable source of energy. India — a country of 1.2 billion with one in four people living without electricity — has emerged as a proving ground for clean energy technology. The world’s second-most populous nation and fastest-growing large economy has stretched the seams of its existing infrastructure, and the Indian government has pledged to bring power to nearly 300 million more people as early as 2019. It’s a challenge that is continents away from Western Pennsylvania and yet energy researchers, companies and government officials in Pittsburgh are closely tied with their peers in India. The same technology being demonstrated for the benefit of struggling Indian villages like Tuvar is also at the center of fledgling efforts in Pittsburgh to figure out how renewable energy can work — and be profitable — on a large scale in the developed world. Researchers and advocates in the two countries are connected in their hope that microgrid technology — which allows for smaller, localized power generation and distribution systems — can bring light, communications, economic opportunity and even safety to low-income neighborhoods. Whether in isolated rural areas where traditional grid networks will never be economically feasible, or in densely crowded cities where storm damage or cyber-attacks can suddenly knock out power for millions, microgrids increasingly are seen as a way to bring clean power closer to people using it. John Camillus is given a flower by a resident of Tuvar, India after holding a forum about his efforts to bring solar power to the village. 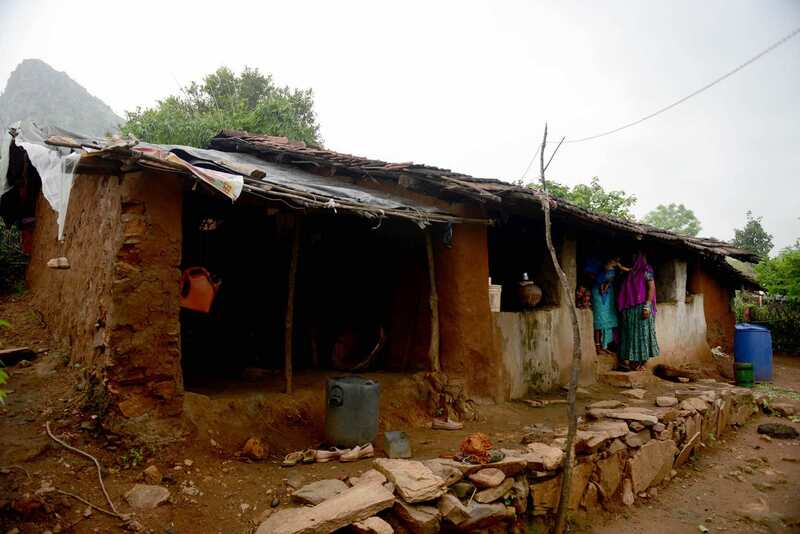 Tuvar residents have no electricity, just like nearly 300 million other Indians -- a full quarter of the population. In August, Mr. Camillus joined Bopaya Bidanda, an engineering professor at the University of Pittsburgh, in visiting India to lay the groundwork for a partnership meant to use Indian engineering expertise to help scale up a solar-powered bioshelter in Pittsburgh’s Homewood neighborhood into a microgrid — a project with the potential to feed energy to dozens or even hundreds of homes in the East End neighborhood. In Homewood, the solar panels are envisioned to power an urban farm and to educate residents about locally grown food and renewable energy. Such an installation would also work in Tuvar, where residents need safe lighting and a boost to farming. In exchange for help in Homewood, Pitt would offer to send students to work in Tuvar, where, alongside local nonprofits and companies, they would support the solar installations, a bank of computers, a telemedicine clinic and other amenities planned there. Eventually, the electricity from the solar project is meant to power a 50-acre irrigation network that would enable the Tuvar villagers to grow higher-value crops and earn higher incomes. This way, they should be able to pay off the cost of installing the systems, allowing developers to earn a profit on the investment. Homewood and Tuvar have different challenges, yet the exchange could help both. “They’re different problems, but we’re using technology to advance the same kind of mission,” said Mr. Bidanda, also a native of India. Tuvar residents gather in the village schoolhouse to meet with an envoy from the Narottam Lalbhai Rural Development Fund and University of Pittsburgh professor John Camillus about the potential of bringing solar power to the village. Reshaping the energy industry in India — a colorful tapestry of cultures, languages, religions and industries — could be daunting. “It’s like 10 blind men feeling at a elephant, you know what I’m saying?” said K.S. Venkataraman, an Indian immigrant to Pennsylvania who has been publishing The Pittsburgh Patrika, an Indian culture magazine with a circulation of about 2,000, since 1995. India has experienced economic ascension that has lifted millions of people into the middle class. It’s a prosperity defined by modernized cities that glimmer with towering shopping malls and five-star hotels, exquisite restaurants and upscale boutiques. More Indians than ever can afford homes, Indian-produced automobiles, cell phone plans and bank loans. 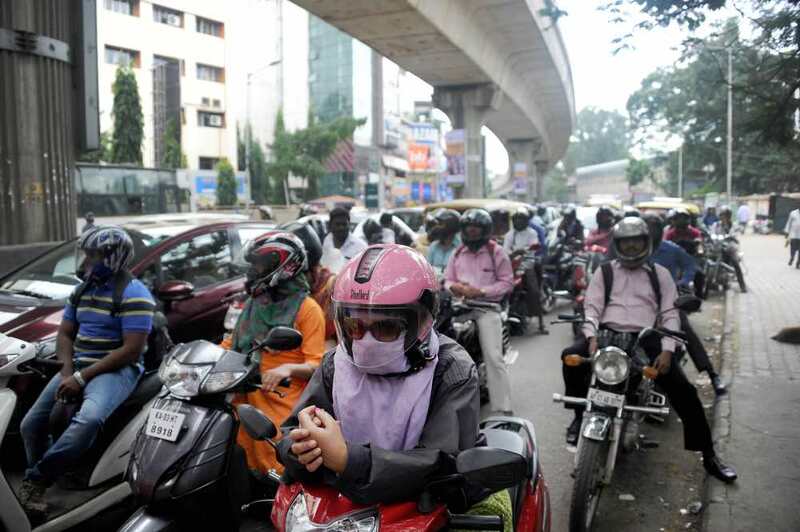 Hundreds of cars, motorcyclists and moped riders sit in traffic in Bengaluru. But that progress has left behind large swaths of the country and has come with the price of pollution. Recent studies have found that fine particulate matter, emitted primarily by automobiles, contributes to nearly 600,000 premature deaths in India. 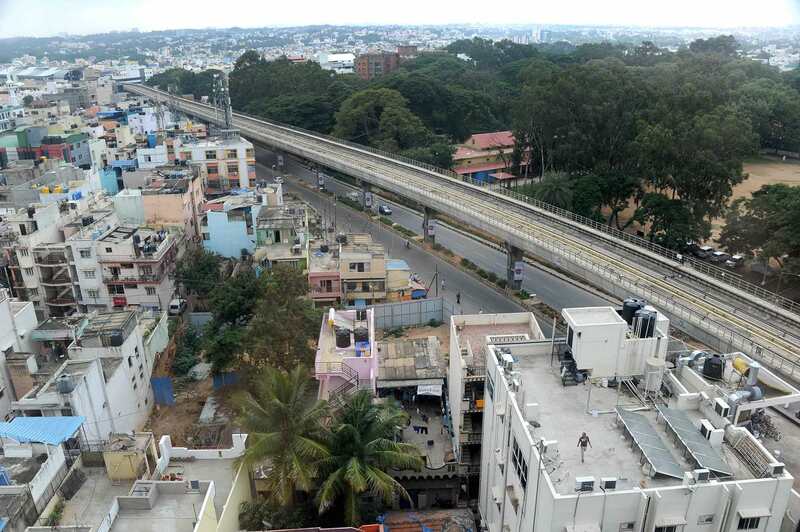 During the researchers’ August visit, the streets of Bengaluru — Mr. Bidanda’s hometown and one of India’s most congested cities — were mired with cars, motorcycles, auto-rickshaws and buses that belch black smoke. In the emerging software and IT hub — the first city in Asia with electric street lights, dating to 1905 — livestock and packs of street dogs roamed freely. Power lines were knotted overhead, sometimes strung around the branches of a tree in lieu of a utility pole. 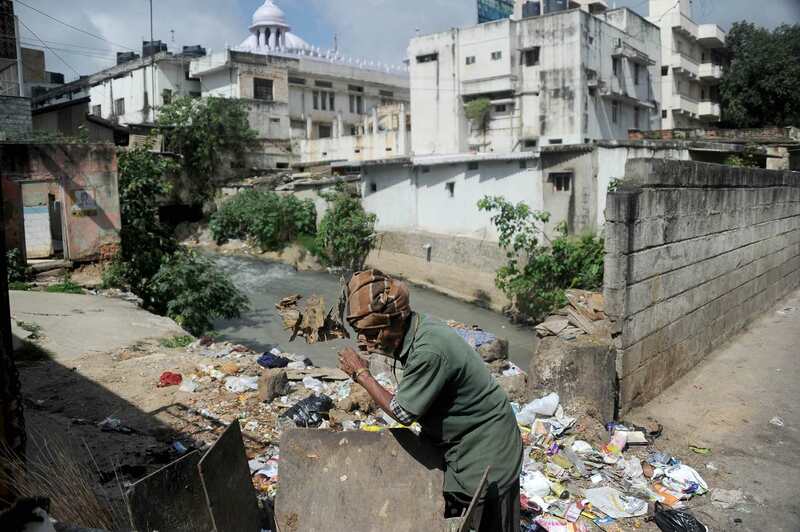 Down the street from 1 MG Lido Mall — a self-described “urban oasis of style & affluence” — a heap of trash clogged one end of an urban body of water called Ulsoor Lake. While the cities grow — along with the demand for cheap energy — the limits of India’s power infrastructure have become evident. Brief outages are embedded in daily life, interrupting daily errands like buying a cup of tea or withdrawing money from an ATM. Larger breakdowns in the electric grid spotlight the extent of the problem: A two-day blackout in 2012 that affected about half the population was the largest any country has ever seen. Meanwhile, beyond the grid in India are roughly 270 million people who lack electricity at all, according to estimates from the World Bank. That’s far more than any other country in the world and about a quarter of the 1.1 billion people worldwide without power. And it’s not just the large swaths of northern India that are off the grid; pockets of darkness exist throughout the country, tantalizingly close to power lines. As of 2012, 21 out of every 100 people living in India were without electricity. In a country with a population of 1,263,589,639 people, that means that 269,144,593 were without power. That's the population of the entire United States outside of Pennsylvania and California. 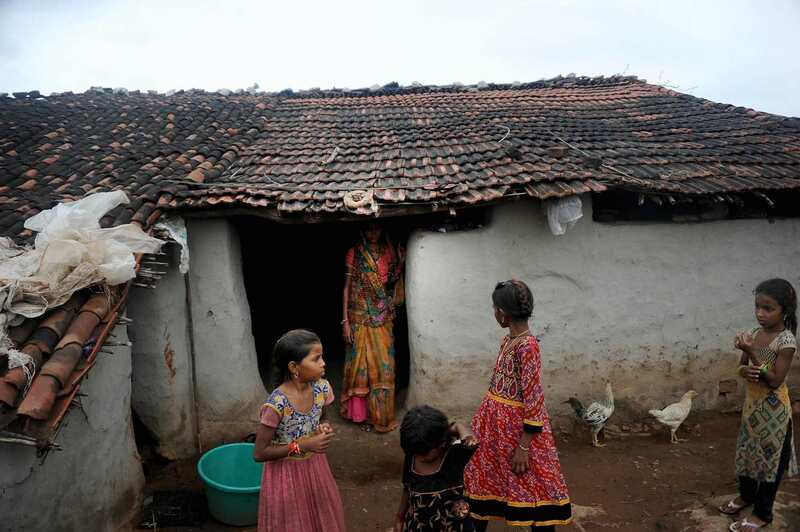 Dhapuuben Kharadi, far right, lives with her daughters, Puniben and Menuben, and their children, in Jetvas, a village that was provided solar panels by the government. 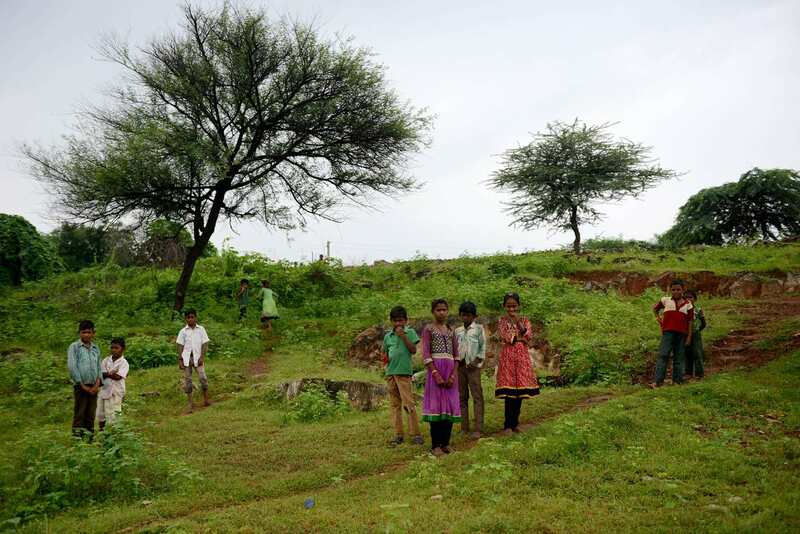 Tuvar is a cluster of 46 households on rolling farmland not five miles from a main highway in the state of Gujurat, where electrification is high. Villagers use fuels like kerosene and firewood, which are expensive, inefficient and can be toxic in poorly ventilated huts, said B.M. Shah, the executive director of the Narottam Lalbhai Rural Development Fund, a nonprofit that has been working for decades to encourage development. The lack of good lighting has a direct impact on literacy rates, as children struggle to read, Mr. Shah explained. Worldwide, the World Health Organization has found prolonged exposure to kerosene fumes during household tasks accounts for the deaths of 500,000 women annually. 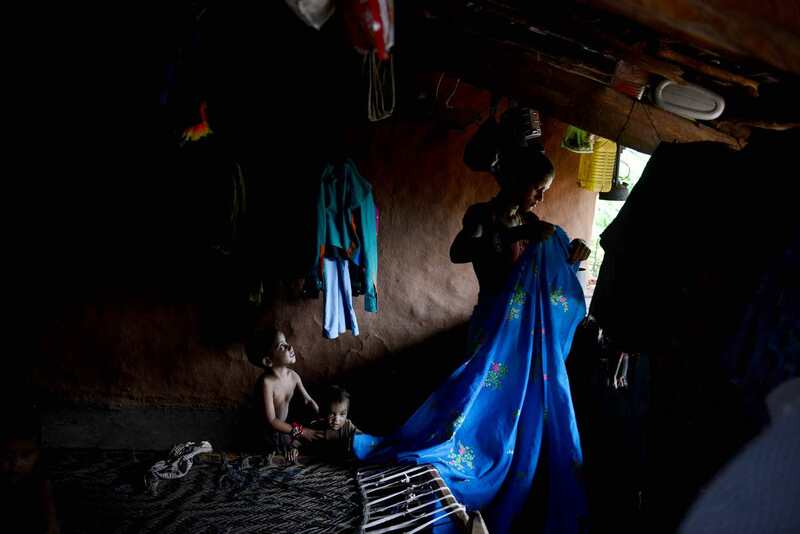 One of Dhapuuben Kharadi's daughters folds clothes by the window at their home in Jetvas, a village that was provided solar panels by the government. With those solar panels, they are able to run several LED lights, a fan, and charge cell phones with the power generated by the panels. 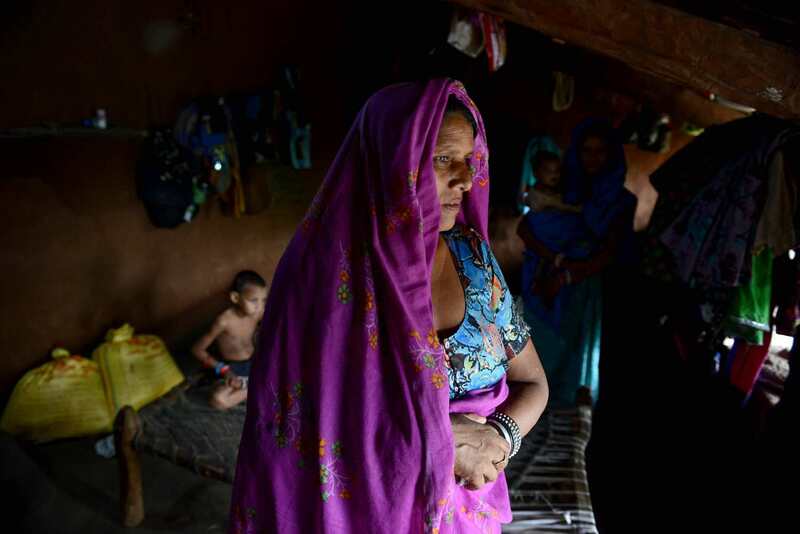 Dhapuuben Kharadi lives with her daughters, Puniben and Menuben, and their children, in Jetvas, a village that was provided solar panels by the government. With those solar panels, they are able to run several LED lights, a fan, and charge cell phones with the power generated by the panels. Dhapuuben Kharadi, right, lives with her daughters, Puniben and Menuben, and their children, in Jetvas, a village that was provided solar panels by the government. With those solar panels, they are able to run several LED lights, a fan, and charge cell phones with the power generated by the panels. One of the grandchildren of Dhapuuben Kharadi chews on some clothing at their home in Jetvas, a village that was provided solar panels by the government. With those solar panels, they are able to run several LED lights, a fan, and charge cell phones with the power generated by the panels. 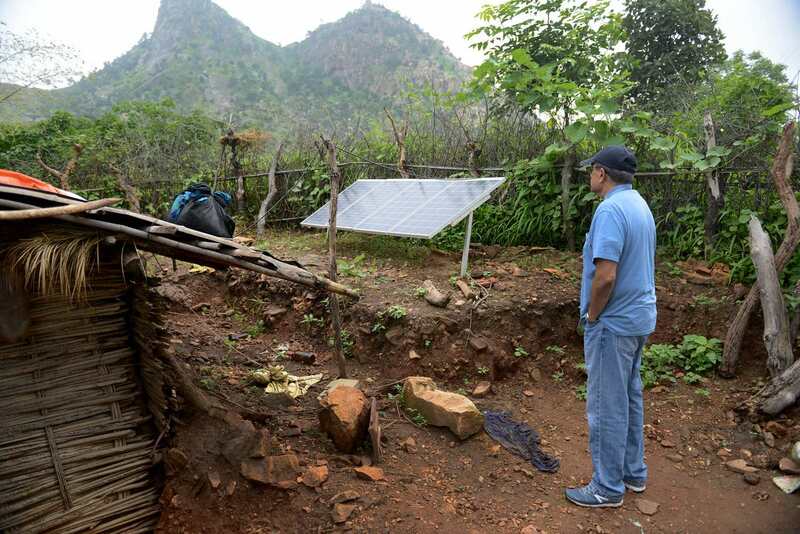 University of Pittsburgh Professor John Camillus arrives at a home in Jetvas, a village where solar panels have been provided by the government to several homes. 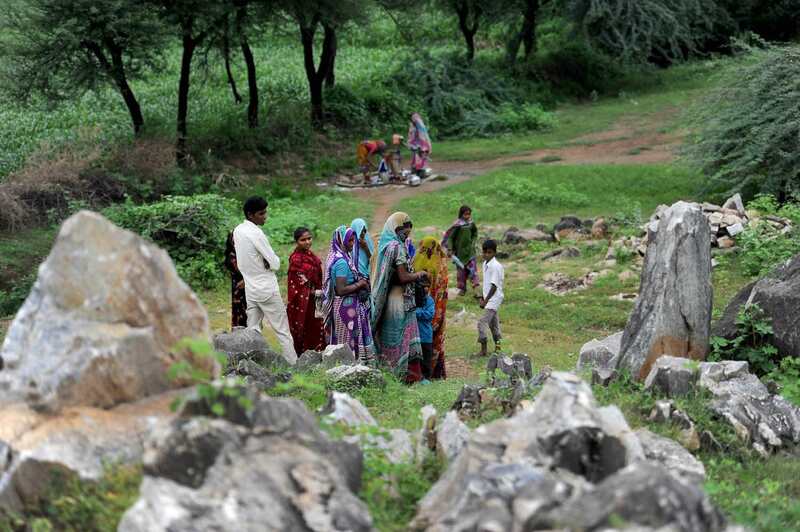 In Tuvar, a village in India, 231 people share the same pump well, their only source of water. The village is off-the-grid, with residents among the 300 million Indians that live without electricity. 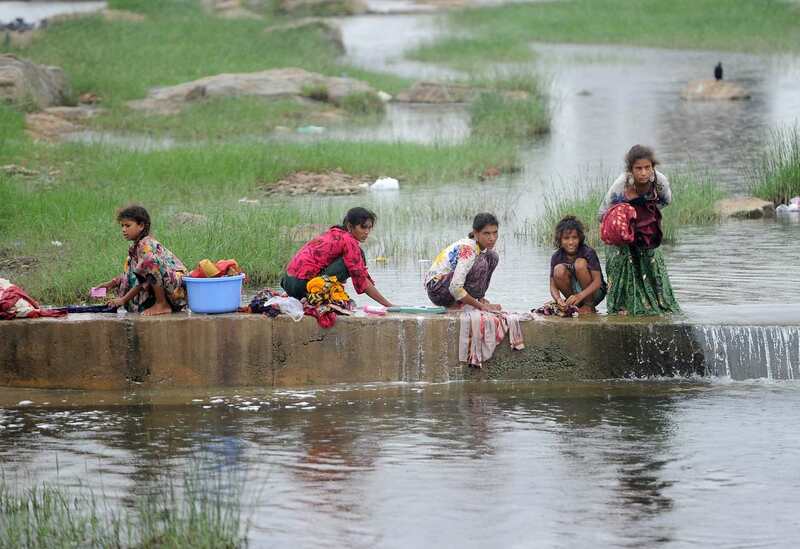 Women wash clothes in a river on the route to Tuvar in India. Children gather as an envoy from the Narottam Lalbhai Rural Development Fund and University of Pittsburgh professor John Camillus arrive at the village of Tuvar. The 231 residents of Tuvar live with no electricity, just like 300 million other Indians, a full quarter of the population of India. Their homes remain dark, even during the day. 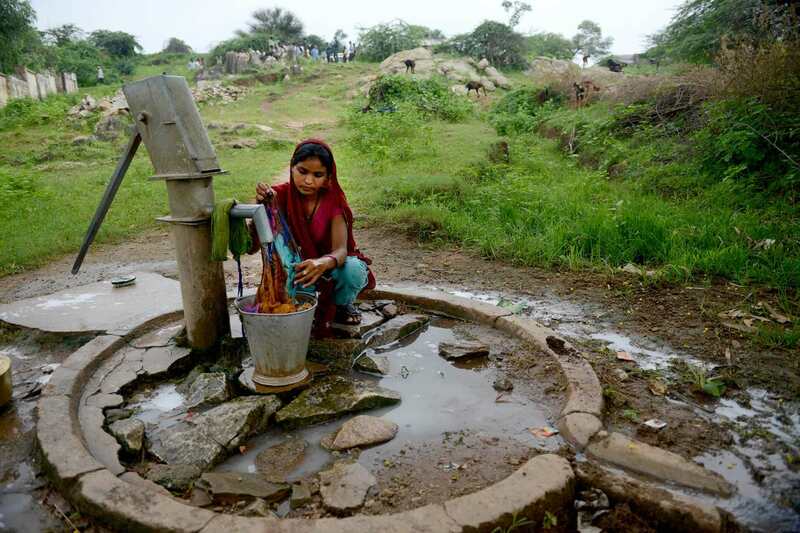 A woman uses a hand-pump well to wash her clothes in the village of Tuvar in Khedbrhma, India. The well is the village's only source of water. 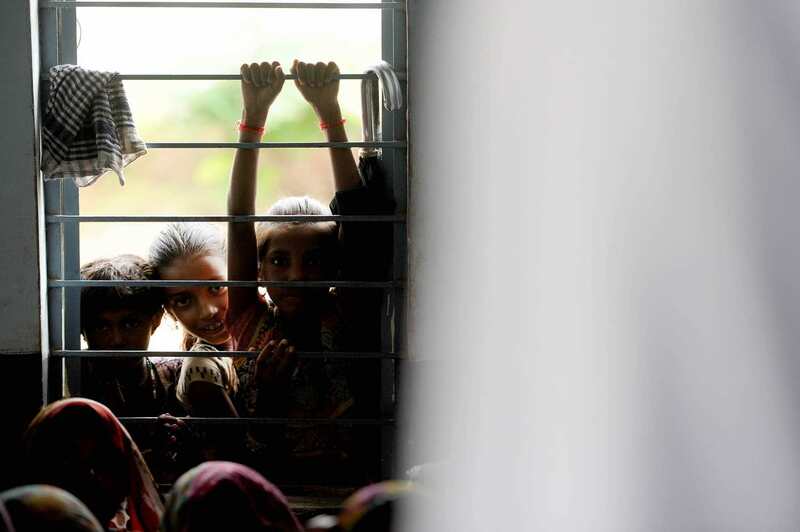 Children watch from outside the schoolhouse as residents of the village of Tuvar in Khedbrhma, India, gather to meet with an envoy from the Narottam Lalbhai Rural Development Fund and University of Pittsburgh professor John Camillus about the potential of bringing solar power to the village. The residents of Tuvar live with no electricity, just like 300 million other Indians, a full quarter of the population of India. Prime Minister Narenda Modi, a former chief minister of Gujurat who was elected in 2014 with the backing of rural voters, has revamped a decades-old government initiative and pledged to spend $11 billion to electrify nearly 18,500 villages and bring consistent power supply to every citizen in coming years. But that progress, too, could come at an environmental cost. The Indian government plans to supply this power mostly through extensions of the electric grid, fed by power plants. About 70 percent of India’s electric power capacity in 2015 came from burning coal, which is a leading source of climate-changing gases in the atmosphere. While renewable energy in the United States is eating into coal’s share of power production in America, analysts don’t expect India to wean itself off coal anytime soon. With the fourth-largest coal reserves in the world and little large-scale alternative, India is ramping up its coal assets by modernizing mines and improving rail and road transport routes, a 2015 Barclays report noted. Coal production could rise by more than 50 percent in the next five years, the report estimated. Officially, India established goals at last year’s climate summit in Paris to reduce by 2030 the greenhouse gas intensity of its economy — that is, emissions for every one unit of gross domestic product — at least a third below 2005 levels. To help meet that target, it pledged to increase alternative energy sources to 40 percent of its installed electric power. India ratified the plan earlier this month. Experts and analysts are cautiously optimistic the country will stick to that promise, in part because of international attention. In June, during a White House meeting with President Barack Obama on how to meet the Paris commitments, Mr. Modi earned a $40 million U.S. investment that could leverage up to $1 billion in funding for clean energy projects. Power plants in the United States, facing clean air regulations and with an abundance of cheap natural gas as an alternative, have begun to abandon coal as a fuel. In India, where there is little large-scale alternative, the burning of coal for electricity has continued to rise. Long before climate change entered the political lexicon, Mr. Camillus grew up near Chennai, at the time known as Madras. He came of age along with his country — he was born shortly after independence from Britain came in 1947 — riding motorcycles, boxing and sharpening his debate skills in school clubs. He grew up Roman Catholic, speaking English and part of a family that pushed him to get a good education. At that time, he said, the two options for a successful professional life were to become either a doctor or an engineer. “I can’t stand the sight of blood,” he said. After earning a bachelor’s degree in technology from the India Institute of Technology in Madras and a doctorate in business management from Harvard, he settled into India’s consulting class. He worked with some of the largest engineering firms in India and did some Cabinet-level jobs for the government, such as helping set up the Central Electricity Authority, which oversees operations in the country’s power sector. John Camillus, a University of Pittsburgh professor, reacts to the site of the villagers of Tuvar gathered as he arrives to tour the village he hopes to bring solar power. While Mr. Camillus felt dual allegiances to India and the United States, a controversial crackdown in the late 1970s on political unrest — in which opponents were imprisoned, press was censored and Mr. Camillus was scrutinized for his Harvard degree and his work with American companies — helped push him to America. He ended up joining the faculty of the Joseph M. Katz Graduate School of Business at the University of Pittsburgh in 1977. He settled in Squirrel Hill with his wife and started a family. “I fell in love with this place,” he said. Betraying his extensive consulting background, Mr. Camillus sometimes gets lost in boardroom jargon and has a soft spot for the PowerPoint slide. Yet for all his convention, Mr. Camillus’ years of consulting also spurred something else, something he said puts him outside the mainstream at business schools: a quixotic belief that companies can make money revolving their business around serving those in need. He set out to test the theory. He held conferences and probed his network of corporate executives. He found examples and published case studies: Ford Motor Co. building a sustainable assembly plant in Brazil; Dow Latin America working sustainability into its growth plans; Acumen, the nonprofit venture fund, funneling its resources to companies in South Asia and Africa delivering affordable health care, water and housing to the poor. He felt emboldened by his permanent academic chair, the Donald R. Beall Professor of Strategic Management, that the school afforded him starting in 1991 — one that came with a healthy stipend and, more importantly, a vote of confidence from the school. But he needed a way to demonstrate it could work. He searched for an ideal technology: one just starting up, one being engineered in Pittsburgh, one with tremendous potential to uplift developing counties and, even better, impoverished communities within wealthy countries as well. After he explored ideas with Mr. Bidanda, a friend and colleague in the engineering school, and connected with John Wallace, a social work professor who had a research focus on the struggling Pittsburgh neighborhood of Homewood, he knew he had found it: renewable energy. 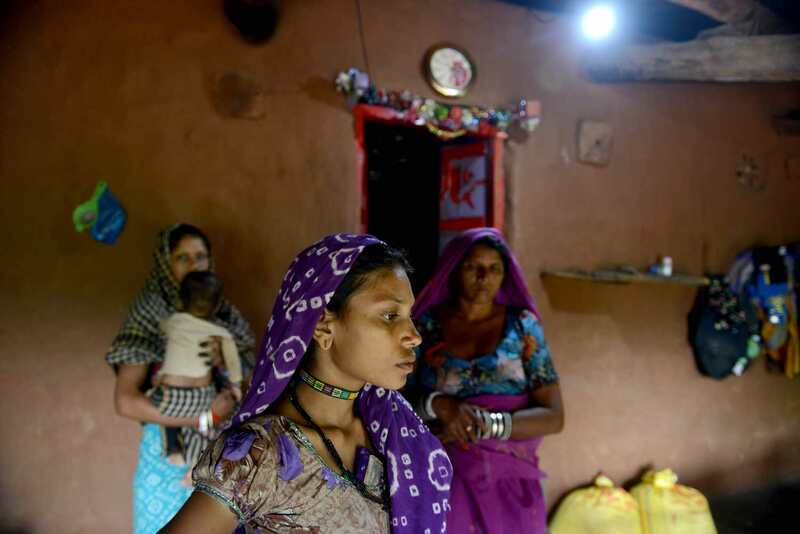 An LED light powered by solar panels provided by the government illuminates a home in the Indian village of Jetvas. The U.S. power grid was designed for an energy-craving country. As such, developers built mammoth power plants along waterways and rail lines, fed mostly by coal, and constructed transmission lines to connect faraway cities and towns. The need to move power long distances spelled victory for Nikola Tesla and Pittsburgh’s George Westinghouse in the 19th century’s fabled “war of currents.” Westinghouse’s alternating current, which can be stepped up to a higher voltage for long-range transmission and stepped back down for household consumption, bested the efforts of his rival, Thomas Edison, he of incandescent light bulb fame who argued in favor of direct current, which flowed in one direction. Today, direct current, or DC, is making a comeback. This time, it has the backing of the University of Pittsburgh’s engineering program, which is building laboratories and office space across 18,600 square feet of the newly christened Energy Innovation Center in the Lower Hill District, housed in the former Connelley Trade School. Run through individual microgrids, direct current makes perfect sense, said Gregory Reed, director of Pitt’s Center for Energy who will oversee the power grid laboratory at the new center. An envoy from the NGO Narottam Lalbhai Rural Development Fund treks to Jetvas, a village that was provided solar panels by the government. With those solar panels, they are able to run several LED lights, a fan, and charge cell phones with the power generated by the panels. Today, plenty of appliances — including computers, efficient lighting equipment and electric vehicles — run on DC power, and solar panels produce it. Mr. Reed is also developing ways of using high voltage direct current to transmit electricity long distances with more efficiency than when using alternating current. Microgrid experiments are popping up everywhere: the Port of Los Angeles in California; a fire station in Charlotte, N.C.; a 2,878-unit public housing complex in Red Hook, N.Y.; remote villages in Alaska; a community center in Seattle; at the Pearl Harbor-Hickam joint U.S. military base in Hawaii. The U.S. has about 160 microgrids with 1,649 megawatts of capacity. As more utilities buy in, microgrid capacity is projected to more than double to 4,300 megawatts by 2020, according to GTM Research, a San Francisco-based firm studying trends in green technology. In Pittsburgh, Mayor Bill Peduto's administration has embraced the notion of a “grid of microgrids,” seeking federal help to section off Pittsburgh's dense urban neighborhoods into individual energy districts. The plan envisions places like Uptown, Hazelwood and the North Side having their own plants producing clean electricity, steam heat and hot water. Duquesne Light Co., which delivers power to 590,000 customers in the Pittsburgh region, is working with Mr. Reed’s program to experiment with a microgrid on the company’s property along the Ohio River. A village girl gives John Camillus a mark (bindi) on his head upon his arrival to Tuvar. Using an $800,000 grant from the Henry L. Hillman Foundation — funding shared with Mr. Reed, who tapped it for his separate direct current research — Mr. Camillus and Mr. Bidanda set out to prove energy could transform Homewood. They worked alongside Mr. Wallace, who had helped publish a study in 2011 that charted Homewood’s decline over the years as it became an urban food desert with a 46 percent poverty rate, rife with tax delinquency, abandoned properties and a shrinking population. Of all U.S. cities, Pittsburgh’s low-income residents — and in particular African-American households — spend some of the highest portions of their incomes on monthly energy bills, according to a separate report released this year by an energy efficiency trade group. Children attended the “Green, S.T.E.A.M. & Play” camp in Homewood in July, where they learned about sustainable growing practices and renewable energy. “You have low-income people with massive bills for utilities, so the affordable housing isn’t so affordable after all,” Mr. Wallace explained. Where prior revitalization efforts failed to turn around Homewood, bringing in affordable and clean energy might make a difference, Mr. Wallace said. If the solar installation were to be scaled up to feed the surrounding houses, it could ease the energy burden on Homewood residents by providing affordable power at a stable rate. On a July afternoon, the professors showed off their work. On what was a formerly a grassy empty lot along Fleury Way, a pavilion of solar panels cast some much-needed shade. Along the fence, flower-filled planters hung — products of a summer camp where nearly two dozen campers were learning about sustainable growing practices and cooking healthy meals. Next to the solar contraption stood a modest building, empty for now but envisioned to eventually house plants and an aquaponic tank filled with fish. Alongside it were the beginnings of an African heritage garden, which will feature foods that slaves brought to America and that were traditionally grown in the South. 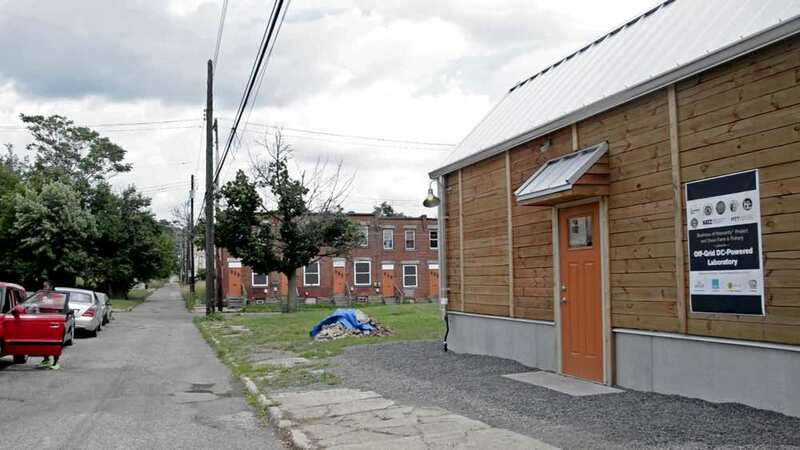 The University of Pittsburgh's solar-powered bioshelter was constructed along what was formerly an empty lot along Fleury Way in Homewood. At the summer program, called “Green, S.T.E.A.M. & Play,” 21 students explored the cities of the future, said Stephanie Lewis, a Homewood resident and director of educational initiatives for the Bible Center Church. These cities include green infrastructure like permeable pavement, green roofs and rain gardens help clean and reuse water supplies, she said. And they are powered by solar and wind energy. Yet for the professors from India, there was a missing piece. For the Business of Humanity model to be held up as tenable, it needed to work on a larger scale. It needed to make money and alleviate strains of poverty all over the world. 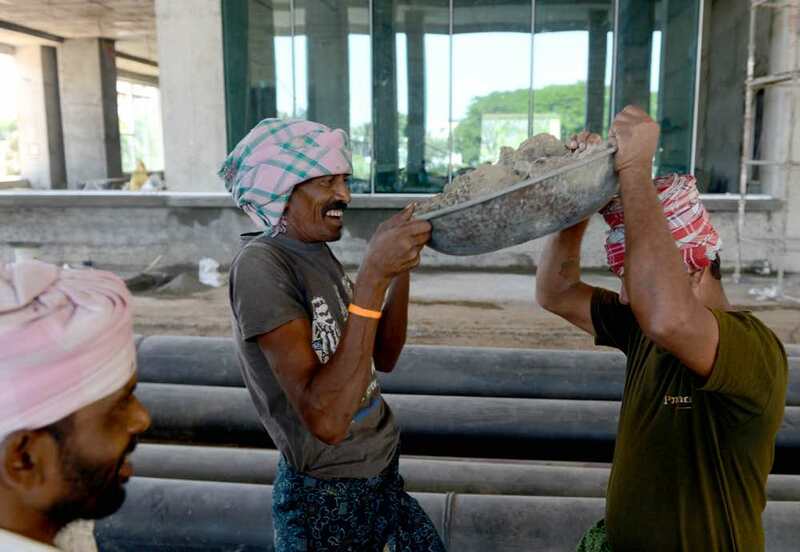 Under a sweltering morning sun, the grinding sounds of heavy construction echoed off the walls of India Institute of Technology Madras in Chennai, a city on India’s southeastern coast where Mr. Bidanda arrived in August to seek help from an old friend. Hundreds of workers were laying bricks for a courtyard and filling in the skeleton of a towering building. The work marked phase two of the school’s new research park, set on 11 acres and totaling 1.6 million square feet of space for research collaborations between the university and Indian companies. The school is calling the buildings the greenest in India. Ashok Jhunjhunwala, a professor of electrical engineering at Indian Institute of Technology in Chennai, shows University of Pittsburgh's Bopaya Bidanda, a professor of industrial engineering, a demonstration room powered entirely by one solar panel. Inside the one finished building, Ashok Jhunjhunwala, an emphatic electrical engineering professor at the school, walked Mr. Bidanda through a laboratory displaying direct current appliances. Powered by a solar panel outside and aided by a storage battery in the corner, a fan circulated overhead, LED lights flipped on, a television display flickered, a blender whizzed to life. “Everything can be powered on DC,” Mr. Jhunjhunwala said. After a ride through the school’s leafy campus in his electric car, Mr. Jhunjhunwala told Mr. Bidanda he could send a few students to Pittsburgh to help turn the bioshelter in Homewood into a full-fledged microgrid. When Mr. Bidanda said he thought the project might be slow to scale up, Mr. Jhunjhunwala waved him down. He said he could send three or four students from IIT-Madras as early as next spring, direct current appliances in tow, to wire the community center triplex in Homewood to hook up to the solar pavilion. They would add more panels, scaling up the installation to 26 kilowatts from its current capacity of six kilowatts. About a week later, on the opposite corner of India, Mr. Camillus landed in Ahmedabad, the capital city in the northwestern state of Gujurat. Early Saturday morning, he left his hotel room in a five-star Hyatt and got in a van for a three-hour trip north through pastoral fields to Tuvar and its kerosene-lamp huts. He was traveling with the Narottam Lalbhai Rural Development Fund, a nonprofit that has been working for decades in this region to raise the quality of life by attacking big problems like malnutrition, sanitation, AIDS prevention and rampant suicide among widowed women. But the nonprofit has yet to try electrification, which could play a critical role in quality of life. 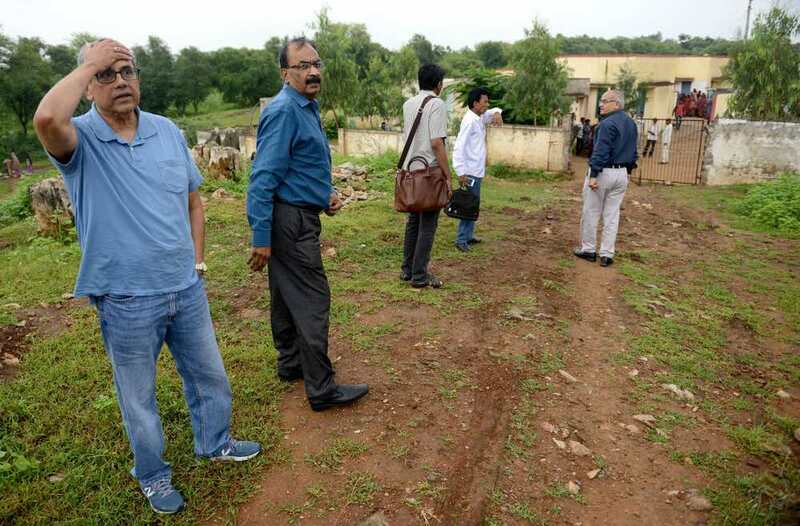 With connections to the group from his time in Ahmedabad, Mr. Camillus saw a chance to see how a microgrid could play out in Tuvar. He could tap the expertise and trust the group — which is the philanthropic arm of The Arvind Mills Ltd., an Indian textile giant — has gained in the village. Beneficial to the development group, energy might gain quicker acceptance and could underpin other advancements in the sometimes insular villages, said B.M. Shah, the executive director of the group. Progressive ideas that deviate outside strict tribal customs are generally treated with suspicion, he said. Helping the residents requires understanding their needs. The India Institute of Technology is building a green research park adjacent to campus. Here, workers use baskets to move rubble from underneath the structure on Aug. 10, 2016. The India Institute of Technology is building a green research park adjacent to campus. 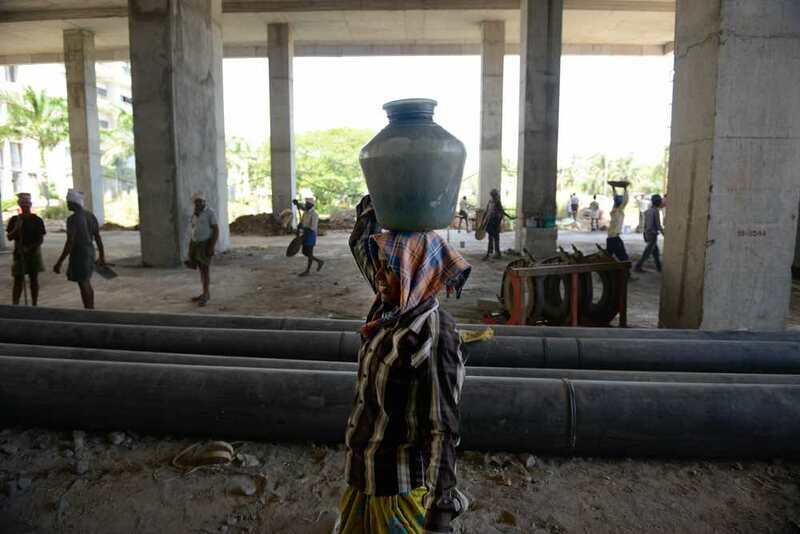 Here, a woman carries water onto the site as men behind her use baskets to move rubble on Aug. 10, 2016. 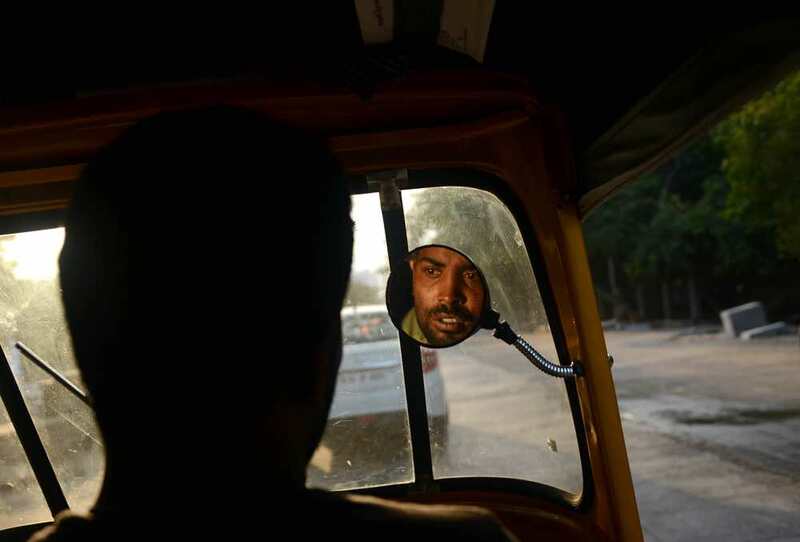 An auto rickshaw driver drives through Chennai, India, on Aug. 10, 2016. 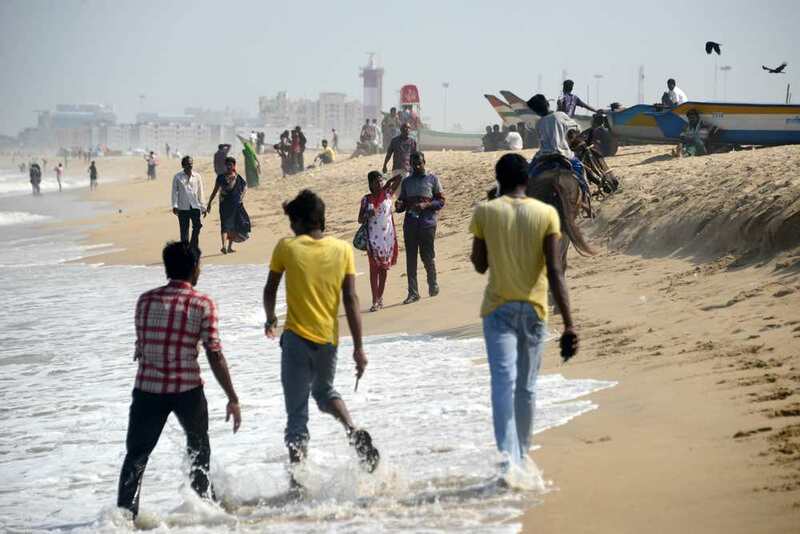 Beachgoers at Marina Beach in Chennai, India, walk along the water's edge on Aug. 10, 2016. 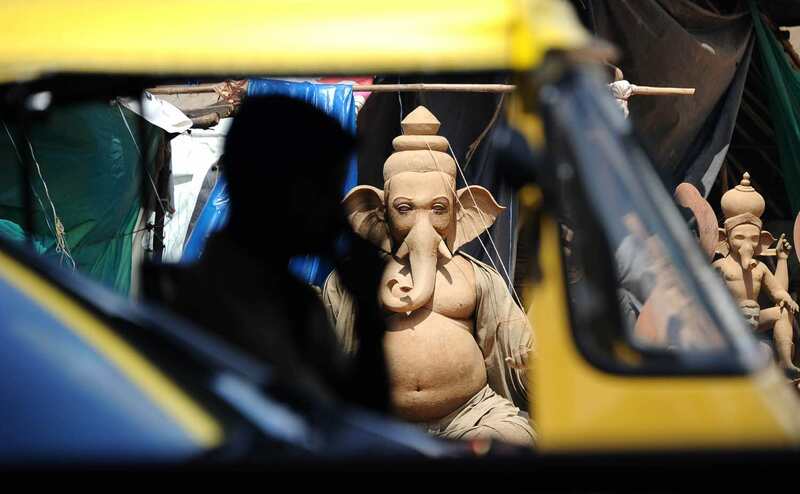 An auto rickshaw driver sits in traffic in Bengaluru, India on Aug. 8, 2016. A man paces back and forth on the rooftop of a building outfitted with solar panels in Bengaluru, India, on Aug. 8, 2016. A man works on a car in Bengaluru on Aug. 10, 2016. A man throws trash into the street in Bengaluru, India on Aug. 9, 2016. 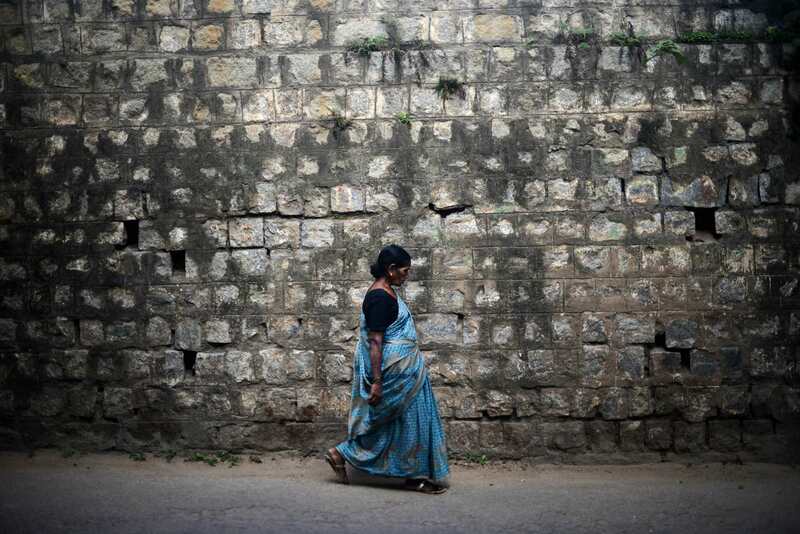 A woman walks in Bengaluru, India, on Aug. 9, 2016. When Mr. Camillus arrived, a girl near the entrance of the school pressed a red bindi on his forehead and handed him flowers. Removing their shoes before entering, dozens of Tuvar residents filed inside the stone-and-mud schoolhouse. The residents sat, divided in equal groups by gender, on the floor. Mr. Camillus, along with Mr. Shah and PremAnand Satgunam, vice president of program development for Apollo Tele Health Services, was told to sit on a chair in the front. Children milled about outside, or stood at the door and crowded in the windows to listen. A soft rain pattered on the roof. Mr. Satgunam, who Mr. Camillus had invited, ran through a list of questions for a formal assessment for the Chennai-based health care system, which is one of Mr. Camillus’ Business of Humanity case studies. Where do residents get water? How much do they earn from farming? How would they feel about getting solar-powered electricity? A uproarious cheer of approval erupted from the group. After the meeting, residents led the group on a small tour, allowing the visitors into some of the huts. Little light could stream through small slotted openings abutting the low-hanging roofs. A woman walked down a small hill to pump water to wash a scarf. Despite being tucked away at the end of a mud road, Mr. Camillus noted how close Tuvar sits to modern amenities. “The 21st century is right over there,” he said, pointing in the distance to a nearby town with electricity and running water. Bopaya Bidanda, left, and John Camillus, right, describe their vision for a solar microgrid in Homewood while showing off the first piece: a bioshelter powered by a canopy of solar panels next to the Bible Center Church, Inc.
Back in Pittsburgh, he has set his plan in motion. In line with his talent for strategic management, he will orchestrate it in phases with developers on the ground who share his vision. Safe World, a Chennai-based company specializing in rehabilitating agricultural production in impoverished areas, will be the project manager, building the solar installation and distribution network and providing each household with four LED lights. It will also install the pumps, tank and filters necessary to provide clean drinking water and build community toilets. With the power comes the potential for an irrigation system that covers 50 acres of unused land so that farmers can increase their crop and earn higher incomes, said Subi Rajagopalan, the director of Safe World. Residents would be trained and employed to maintain the power infrastructure and oversee the larger agriculture business. Alongside Safe World, Mr. Satgunam of Apollo Health has started looking for a property to build a local telemedicine center with a bank of computers that could connect to Apollo hospitals, bank accounts and government services. Put all together and within a year of having freshly arable land and new jobs, rising incomes might be able to pay off the system. On an investment of $91,000 — relatively small for a company that has tackled challenges as large as desalinization — Mr. Rajagopalan expects to make a 15 percent return over 15 years. Before leaving India, Mr. Camillus got a chance to see a glimmer of progress. 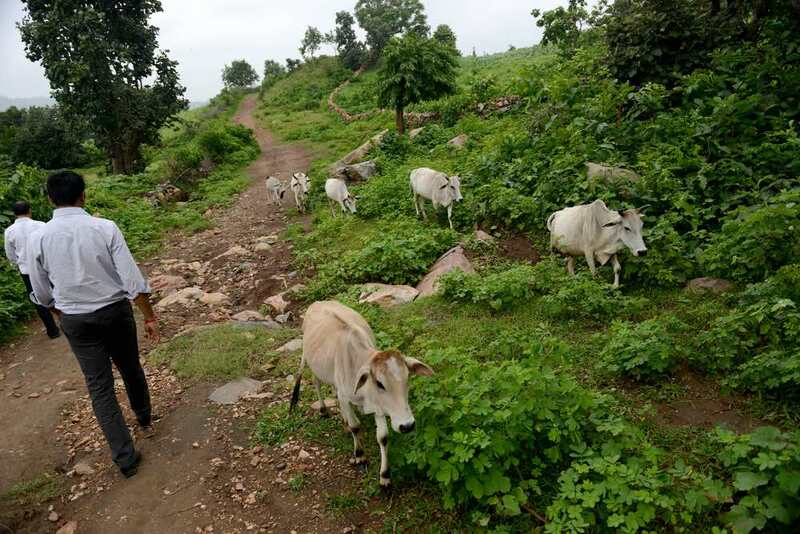 Before heading back to his hotel in Ahmedabad, the professor made one last stop: Jetvas, a remote village about 28 miles away from Tuvar, set along a mud road that gave way to ruts so deep that the van had to stop and he was forced to walk the last stretch. There, a mother and her four children showed off a 400-watt solar panel affixed to her roof. Inside, she powered LED light bulbs, a fan, a small battery. The Indian government, as part of its electrification goals, came by six months earlier to install the panel. With a power outlet, she now can use a mobile phone to connect with her husband, who works long hours for one of the many marble and stone producers in the region. In an area where the closest water pump is a mile round-trip walk, the simple power upgrade has been a tremendous convenience, Dhapuuben Kharadi said, through a translator. 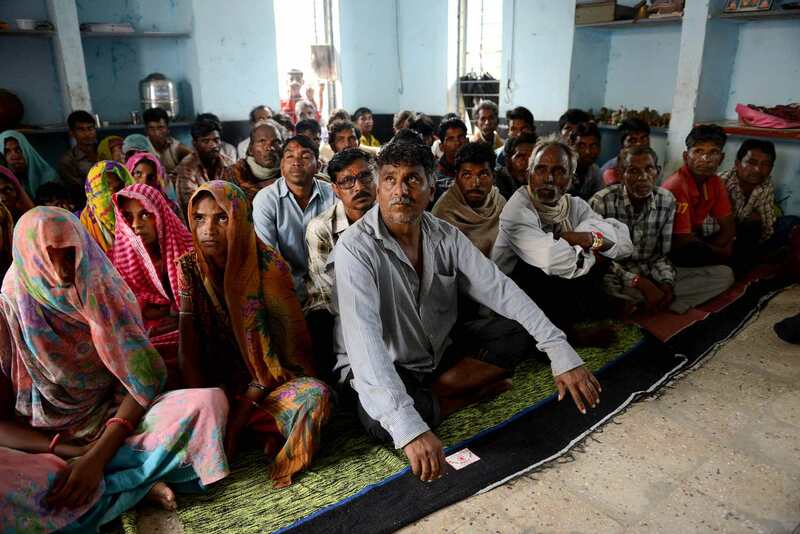 Funded by a grant from the Pulitzer Center on Crisis Reporting, business reporter Daniel Moore and photographer Michael Henninger traveled to India for three weeks in August. 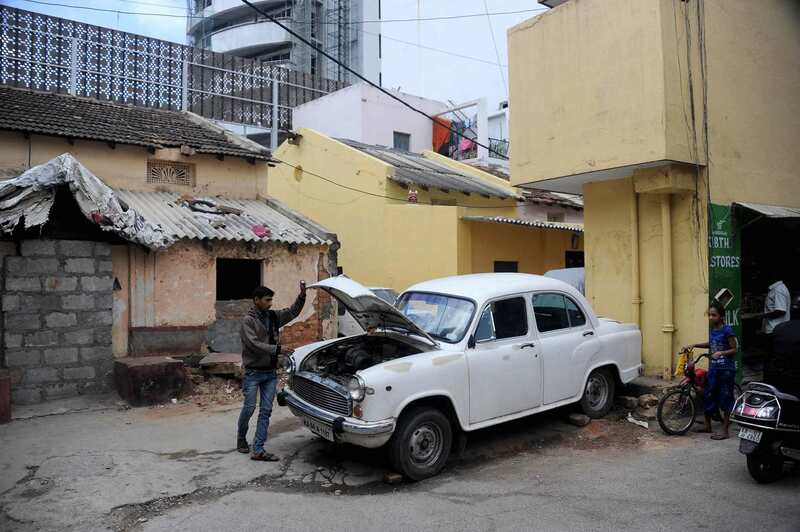 In the World Power series, they document energy’s ties to rapid economic growth in India. They show how researchers in Pittsburgh are working with their Indian counterparts to advance clean sources of electric power in both rural villages in India and urban neighborhoods in the developed world.